The Abey Lugano offers the very latest in European chic, with its sleek squareline design and knife edge low profile brushed stainless steel finish. The Abey Lugano offers the very latest in European chic, with its sleek squareline design and knife edge low profile brushed stainless steel finish. Featuring a subtle yet stunning drainer board, it resembles the textural contours of a freshly mown field with its broad alternating brushed grain stroke finish. The Stratus, a masterpiece in kitchen aesthetics and craftsmanship. 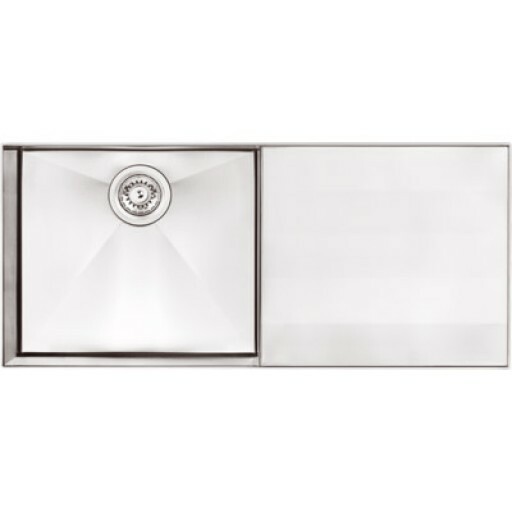 Overall Sink Size - 948mm L x 460mm W. Bowl Size - 460mm L x 400mm W x 215mm D.